Former IBF Inter-Continental Super Middleweight title challenger Toks Owoh is set to begin his second campaign for championship glory in earnest, albeit this time in the Cruiserweight division. 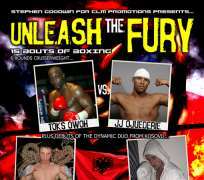 His opponent, at the Steve Goodwin promoted 'Unleash The Fury' event at York Hall in Bethnal Green, London, on Saturday 5th March 2011, will be former Southern Area Light Heavyweight Champion JJ Ojuederie. It was in 2000, after amassing a 16-1 record littered with TKO stoppages, that Toks earned the right to challenge American Glen 'Road Warrior' Johnson for the IBF Inter-Continental Super Middleweight Crown. Toks' dream of a World title shot came to an abrupt end when he was stopped in the sixth round. Johnson's unexpected victory catapulted him to World fame and embarked him on a journey that see him move to Light Heavyweight and capture the WBO Inter-Continental light heavyweight title, before securing IBA, IBO and IBF Light Heavyweight World crowns. Johnson became a super star and battled, and beat, such notables as Clinton Woods Antonio Tarver, Roy Jones, Daniel Judah and Yusaf Mack, whilst Toks on the other hand was left in the wilderness. No fights materialised for almost two years and when they did he had more or less been consigned to 'journeyman' status. In October '10, following a five year sabbatical, Toks made his long overdue return to the ring with a warm-up four rounder against Hastings Rasani. A tidy 39-37 points victory convinced Toks that he still had what it takes and the search for a promoter began. His search didn't take that long and in December 2010 promoter Steve Goodwin signed Toks. The bout against JJ Ojuederie on March 5th will be Toks' debut under the Goodwin Promotions banner and his first step back towards the top flight. Earlier today Toks spoke briefly on his upcoming fight. “There's not much for me to say. It's Leon Williams I really want but he don't want to fight me. He knows what I am capable of, so he don't want to fight me. JJ's been calling me out for a long time so why not fight him. I've been in there with some of the best fighters in the world, I've learned from being in with the best. JJ's not in my league, just look at my record JJ's never fight anyone like I fight. Toks Owoh versus JJ Ojuederie is supported by a huge fourteen bout undercard featuring some of London's best upcoming talents and includes Ultrachem TKO's 'Dynamo' Daryl Setterfield against Birmingham's Andrew 'Paddy' Patterson. Three Ultrachem TKO gym mates of Daryl Setterfield are also on the show, Light Heavyweight Joel 'El Toro' McIntyre, Light Middleweights Nathan Weise and Brett O'Callaghan, all against yet to be named opponents. Also appearing on the show are Rainham Super Featherweight Richard Hines, Luton Lightweight Michael 'Chunky' Devine, unbeaten Biggleswade Light Middleweight Jamie Boness, Minster. Kent Light Heavyweight Dan 'Woody' Woodgate, Woolwich Super Middleweight Eder Kurti, Waltham Abbey Light Welterweight Phil Gill and unbeaten in twelve Hackney Middleweight Wayne Alwan-Arab. Making his first outing as a professional is Highbury Super Featherweight Charlie Kelly who is set to face the highly experienced Birmingham battler Anthony 'Spanner' Hanna. Also making their pro debuts at 'Unleash The Fury' are Harlesden Lightweight Met Sekiraqa and former World Kick Boxing Champion, Llir Canolli from Cosavo.